Whether it's pasta, spaghetti or linguini with clam sauce, con le Vongole or alle Vongole, it's all the same thing. 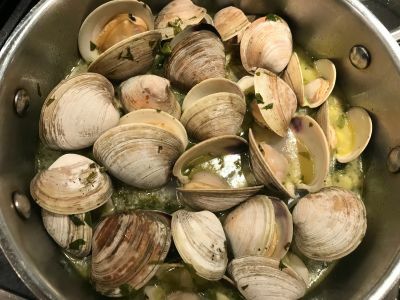 If you like hard shell clams you will certainly like this recipe. Because the clams are steamed right in the sauce, you get all the clam flavor plus the juices the clams exude when they are cooking. And the whole dish takes just about as long as it takes to cook your pasta. This recipe cooks within 10-12 minutes so it is good to have everything ready to go. And you always want the pasta to be done first because once the clams open, you are done and you want to serve the dish. If you continue to cook the clams or leave them sitting around they get rubbery. They are still fine to eat but won't be quite as good. And we use a little trick that will keep the pasta warm and moist while it is waiting for the clams to finish. Before you get started, if you are not familiar with cooking clams, please read Cooking the Clams. This will tell you how to tell if the clams are cooked properly and are ok to eat. Do not ever eat clams that don't open! So go find some fresh clams and let's get cooking. Enjoy and let us know how you like it or how you would change it to make it even better! 1. At least an hour before you plan to cook this dish, we need to clean the clams. See how to Prep and Clean hard shell clams for instructions on that. 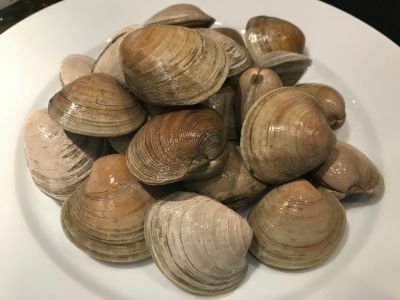 And once your clams are clean you can leave them in the refrigerator in a colander placed over a bowl with a damp towel on top for several hours or more. 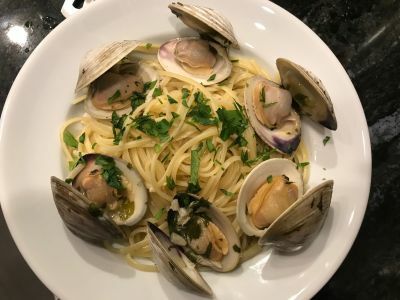 Separate the canned clams from the juice and add the juice to the wine, reserve the clam meat (if there is any grit, strain the juice and rinse the clams, inspect the clams for small pieces of shell). 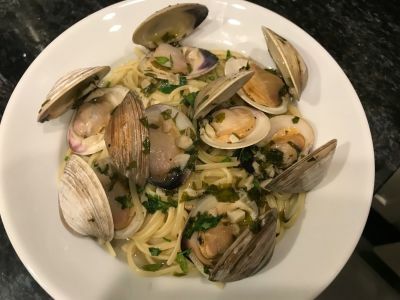 If you don't want to use the canned clams or can't get good quality canned clams, add an additional 1/2 c bottled clam juice, white wine or water. 3. Add 3 1/2 quarts of water and 2 T of salt to a pot large enough to hold the pasta. Bring the water to a boil over high heat. 4. 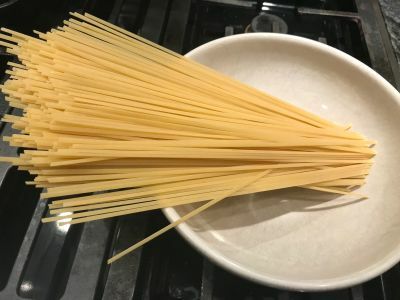 Once the water is boiling add the pasta to the water. Set the timer for 8 minutes and stir the pasta occasionally. 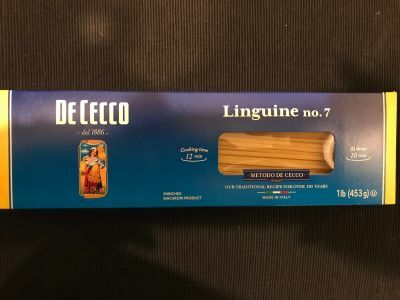 As you can see in the pictures below, DeCecco calls for an Al dente cooking time of 10 minutes, so we are cooking it 8 minutes here because we will finish it up on the stove while we are waiting for the clams to open and the sauce to be finished. 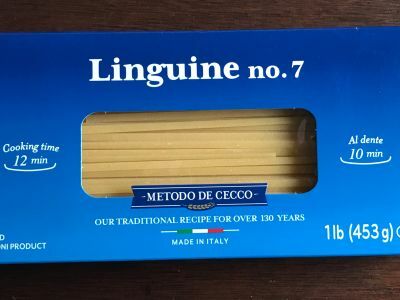 If you don't have an Al dente cooking time, cook it for about 2/3 to 3/4 of the called for time. 5. 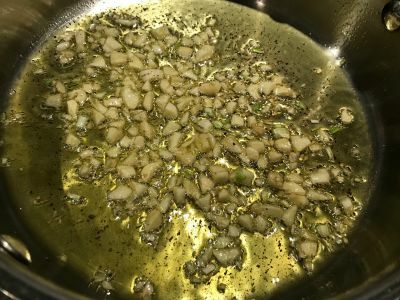 Once the pasta has been cooking for 2 minutes, go ahead and turn the heat on medium under the oil, butter, garlic, ground black pepper and the pepper flakes. Cook until the garlic is fragrant but do not brown the garlic. It should take 2-3 minutes to accomplish this. 6. 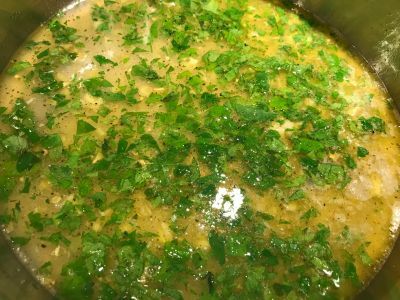 Add 1/2 of the wine, clam juice and lemon juice and 1/2 of the parsley to the pan and bring to a boil over medium heat. This should take 1-2 minutes. 7. Once the liquid is boiling add the clams and once it is boiling again, reduce the heat to medium low and cover. Make sure the heat is high enough that it continues at a low boil while cooking the clams. We need to generate steam to cook the clams. 8. 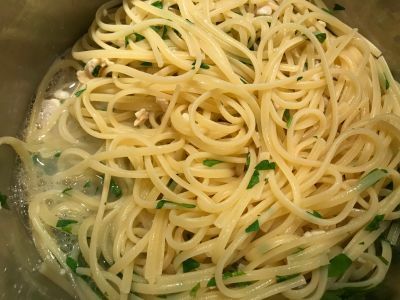 When the pasta is done, drain it in a colander and add it back to the pan you cooked it in along with the remaining wine, clam juice and lemon juice mixture and the canned clam meat. Turn the burner to medium low and cover the pot. Stir the pot occasionally to make the sure the pasta does not stick and that it is coated with the liquid mixture. If you're still not ready after about 2 minutes, turn the heat off. We're not trying to cook the pasta any further. 9. As soon as the clams open turn off the heat under the sauce pan. 10. Portion the pasta into serving bowls and cover with the clams and the sauce. Top with the remaining parsley and you are ready to serve. You want to serve this with a nice crusty baguette to sop up all the sauce in the bottom of the bowls. Enjoy! And be sure to let us know how it came out and what you do differently to make it even better.